Summary: Livy is visiting her Australian grandmother for the first time since she was five. Bob has been waiting in the closet since Livy told him to five years ago. Livy has forgotten all about Bob, but as they spend time together, gradually her memories return. As a five-year-old, she thought Bob was a zombie, but now she doesn’t know what he is. Adults can’t see Bob, and Livy starts to forget him as soon as she’s away from him. 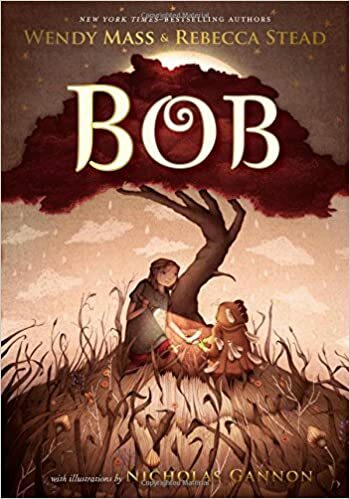 As the two of them reconstruct what happened the last time Livy visited, they slowly begin to uncover the truth of Bob’s origins, and his importance to Livy and to the drought-stricken community where her grandmother lives. 208 pages; grades 3-7. Pros: When I heard of a collaboration between Wendy Mass and Rebecca Stead, I could scarcely contain my glee. Although this book is shorter and different from their previous work, it is still a masterpiece of storytelling that will appeal to a wide age range, starting as a read-aloud for primary grades. Cons: It would have been nice to have more illustrations. If you would like to order this book on Amazon, click here.